The Academy is a cauldron of ideas and perspectives in continuous motion. The creative spirit of our faculty, alumni, and students is constantly adding insight and meaning to our understanding of Jewish tradition and values, and to our appreciation of how our Jewishness is manifesting in contemporary life. Below is a sample of their distinguished work. Jewish Unity vs. Sephardic Particularism: Rav Uziel's Sephardic Vision for the Jewish People; Conversations: The Journal of the Institute for Jewish Ideas and Ideals: Examines the views, goals and actions of this important leader. Mourning and Mitzvah: Celebrated its 25th anniversary in 2017 with a special edition issued by the publisher. The book includes the author's gleanings of the last 25 years of work with those who grieve, as well as the growth in her own personal understanding of the processes of change. The Jewish Book of Grief and Healing (Contributing Author): Contributed the preface and selected articles. Jewish Journal, Frequent Columnist, 2005-Present. Jewish Sacred Aging, Monthly Online Column, 2009-10. Journal of Jewish Communal Service, "The Community as Healer: Coping with Katrina," Winter/Spring 2007. Sh'ma, "Doing Kaddish," October 2003. Midrashic Mirrors: Creating Holiness in Imagery and Intimacy. A collaborative exploration of Torah in text and collage. 2012. 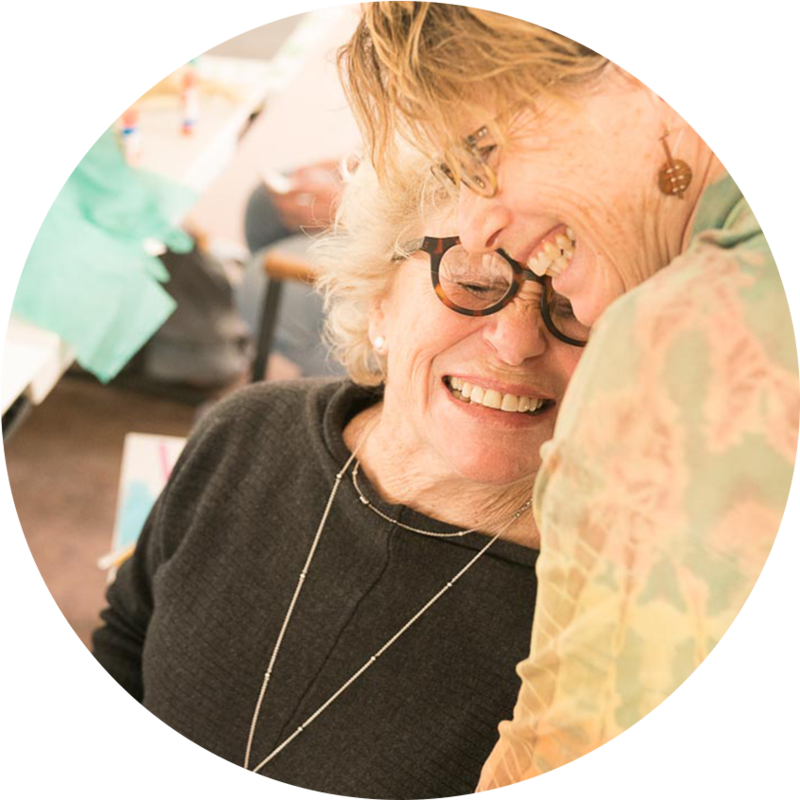 “The Art of Comfort.” Collaboration with Jewish Artists in projects to create a visual culture to support the mitzvot of caring for the sick and grieving. 2007-10. She Rises While It Is Still Night: Dreaming in the Four Worlds of Kabbalah: Explores a spiritual approach to understanding our dreams, grounded in twenty years of dream studies and linked to kabbalistic understandings of the structure of reality. Loving Prayer: A Study Guide to Everyday Jewish Prayer: This introduction to Jewish prayer, explores the connection of prayer with Jewish mystical tradition and the role of creative imagination in enlivening our prayers. “Inner Dimensions,” January to September 2017 (to be resumed in 2018). An on-going series of essays on the spiritual and ethical dimensions of political events since the 2016 election. Hadassah Magazine: “Sinai’s First Responders,” spring 2013; “Finding Freedom Within Ourselves: Righteous Women in the Bible,” spring 2015; and “Spreading Light at Hanukkah,” winter 2016. Huffington Post, commentaries on Purim, Passover, Rosh Hashanah, and Thanksgiving in 2013-14. These articles offer comments on women’s issues and Jewish holidays. Huffington Post, “3 Ways the Jewish Law Relates to Laudato Si,” A commentary on the Pope’s encyclical on environmental concerns, in relationship to Jewish understandings. Jewish Journal, “Why Religion Is a Laughing Matter,” January 9, 2015. A response to the attacks on Charlie Hedbo magazine in Paris. Jewish Journal, “Another Mutation of the Antisemitism Virus,” February 13, 2016. Discussion of an example of antisemitism being spread through materials used in public schools. “New Light on Rosh Hashanah,” audio series for the month of Elul 5777 (August-September 2017). (Corresponding blog posts are accessible here) The audio and written teachings explore specific Rosh Hashanah prayers and texts, to inspire and deepen users’ experience of the High Holy Days. A City Haphazard: Jewish Musicians in Los Angeles, 1887-1927: A City Haphazard covers a crucial but overlooked period of music history and Jewish life in Los Angeles through five case studies of nearly forgotten musicians. The shaky period between 1887 and 1927 had its share of ups and downs, successes and failures, milestones and growing pains. In their own ways, large and small, Leopold M. Loeb, Alfred Arndt, Victor Rosenstein, Abraham Frankum Frankenstein, and Walter Henry Rothwell helped lay the difficult groundwork for what would become a musical Mecca and home to the country’s second largest Jewish population. Jews, Music and the American West: Portraits of Pioneers: This book highlights musicians who reflected and helped shape the unique cultural landscape of the Western United States from the late nineteenth to the mid-twentieth century, with a few remaining active beyond that time frame. As a group, they typify the freedom of opportunity and creative expression characteristic of the region. As individuals, they represent multiple areas of the musical experience: commercial, sacred, performing, conducting, composition, criticism, education, enrichment, vocal, and instrumental. Music in Our Lives: Why We Listen, How It Works: Virtually every day, a new brick is added to the wall of interdisciplinary information, drawn from psychology, neuroscience, evolutionary biology, ethology, anthropology, ethnomusicology and more. This book develops, supports, challenges, and diverges from this abundance of material, which is flourishing at such rapid speed that it is nearly impossible to keep up. It adds a unique and compelling voice to this body of literature, which is ever growing in sophistication and popularity. Music in the Hebrew Bible: Understanding References in the Torah, Nevi'im and Ketuvim: This book investigates musical citations in the Hebrew Bible and their relevance for our times. Most biblical musical references are addressed, either alone or as a grouping, and each is considered from a modern perspective. The book consists of one hundred brief essays divided into four parts: Introductory essays; Torah (Pentateuch); Nevi’im (Prophets) and Ketuvim (Writings). Music in Biblical Life: The Roles of Song in Ancient Israel: Music was integral to the daily life of ancient Israel. It accompanied activities as diverse as manual labor and royal processionals. At key junctures and in core institutions, musical tones were used to deliver messages, convey emotions, strengthen communal bonds and establish human-divine contact. Synagogue Song: An Introduction to Concepts, Theories and Customs: Throughout history, music has been a fixture of Jewish religious life. Musical references appear in biblical accounts of the Red Sea crossing and King Solomon’s coronation, and music continues to play a central role in virtually every Jewish occasion. Topics include the diversity of Jewish music, the interaction of music and identity, the emotional and spiritual impact of worship music, the text-tone relationship, the musical component of Jewish holidays, and the varied ways prayer-songs are performed. Social Functions of Synagogue Song: A Durkheimian Approach: This book paints a detailed picture of the important role sacred music plays in Jewish religious communities. It explores one possible way to approach the subject of music’s intimate connection with public worship: applying sociologist Émile Durkeim’s understanding of ceremonial ritual to synagogue music. Durkheim observed that religious ceremonies serve disciplinary, cohesive, revitalizing, and euphoric functions within religious communities. Emotions in Jewish Music: Personal and Scholarly Reflections: This book offers an insider’s view of music’s impact on Jewish devotion and identity. Written by cantors who have devoted themselves to the study and execution of Jewish music, the book’s six chapters explore a wide range of musical contexts and encounters. Topics include the spiritual influence of secular Israeli tunes, the use and meaning of traditional synagogue modes, and the changing nature of Jewish worship. Quotations on Jewish Sacred Music: A collection of over 700 quotations culled from an array of sources, including rabbinic and theological texts, sociological and anthropological studies, and historical and musicological examinations. The book is divided into five chapters: What Is Jewish Music? ; Spirituality and Prayer; Hazzan-Cantor; Cantillation-Biblical Chant; and Nusach ha-Tefillah-Liturgical Chant. This is a valuable and easy-to-use reference book for scholars, musicians, synagogue staff, and anyone else seeking concise thoughts on major aspects of Jewish sacred music. Music, Theology, and Worship: Selected Writings, 1841-1896: This book offers a representative collection of insightful essays about devotional music from nineteenth-century scholars and practitioners. Addressing the social and theological import of church music, this text also explores the divine quality of the human voice, the spiritual efficacy of congregational singing, and a host of topics pertinent to church life. Those interested in the relationship of music and religion will find value in the descriptions, opinions, and analyses. Music and Jewish Religious Experience: Social and Theological Essays: Offers six studies on specific aspects and functions of Jewish sacred music, both social and theological. Rather than following a single theme or building on a sustained thesis, this book covers a variety of subjects, ranging from music and prophecy to social uses of synagogue song. The central aim of this volume is to provide the reader with fresh insights into specialized areas of Jewish musical investigation, and to demonstrate the broader meanings and value of music in Jewish religious life. Music in Jewish Thought: Selected Writings, 1890-1920: With the nineteenth century came new freedom for European Jews. Enjoying an integration that had been denied since the Middle Ages, they now wrestled with the form and degree of that integration in all areas of their lives, including in their creation, appreciation, and criticism of music. The writings focus on Jewish musicology, biography, historical surveys, secular music, and those songs performed in the synagogue. Perspectives on Jewish Music: Secular and Sacred: Presents five unique and engaging explorations of Jewish music. Areas covered include self-expression in contemporary Jewish secular music, the rise of popular music in the American synagogue, the theological requirements of the cantor, the role of women in Sephardic music and society, and the personal reflections of a leading figure in American synagogue music. Its wide-ranging topics and disciplinary approaches give evidence for the centrality of music in Jewish religious and secular life, and demonstrate that Jewish music is as diverse as the Jews themselves. The Value of Sacred Music: An Anthology of Essential Writings, 1801-1918: This collection of historically significant essays focuses on the purpose and function of sacred music. Issues of historicity, spirituality, standardization and other topics central to the study of Protestant, Catholic and Jewish sacred music from 1801 to 1918 are explored. Moving from musicology to psychology and to religious studies, this volume captures the breadth of scholarship available in the field, as well as serving as a useful introduction for those readers just beginning their study of sacred music. Jewish Sacred Music and Jewish Identity: Continuity and Fragmentation: This book explores complex issues of religious pluralism and the preservation of Jewish identity in the context of American culture today, drawing on the perspective of the Cantor’s office. Featured are the collected writings of Cantor William Sharlin, well-known and influential scholar, cantor, composer of synagogue music, and former professor at Hebrew Union College, Los Angeles. The essays presented here are sure to engage readers interested in the place of music in religion, and those concerned with the state of religion in the post-modern world. On Sacred Ground: Jewish and Christian Clergy Reflect on Transformative Passages from the Five Books of Moses: An essay entitled “All God’s Children,” explores the most fundamental idea in the Hebrew bible. Illuminating Letters: Paintings and Essays on the Kabbalah: An essay entitled “The Hebrew Letters”, articulates the depth of the Hebrew alphabet found in the Midrashic and Kabbalistic literature. It explicates its spiritual depth found in both the meaning of the words, its shapes, sounds and numerical equivalent (Gematria). King David and Kabbala, Psychological Perspectives: A Quarterly Journal of Jungian Thought: This article examines roots and themes of King David's development from a psychological perspective. It also summarizes some salient concept in the Kabbalah. Mussar: A Psycho-Ethical Model of our Time, Conversations: The Journal of the Institute for Jewish Ideas and Ideals: This article examines the major concepts of Mussar, how it can be applied to Jewish growth and spirituality today and how it has been utilized at AJRCA. Bridges Across the Divide, Conversations: The Journal of the Institute for Jewish Ideas and Ideals: This article examines the importance of interfaith and intra-faith dialogue in our contemporary society. It illustrates some of the dynamics necessary to succeed in this endeavor, and some of the current deliberations on the topic. Two Voices, Conversations: The Journal of the Institute for Jewish Ideas and Ideals: This article explains two powerful divergent voices found in the Orthodox Jewish community. It identifies the voices of 'Fear' and the voices of 'Love,' as they clash and sometimes find integration in religious practice and ideology. It examines how these voices have developed over the past three decades as movement toward a Fear-based ideology has gained prominence and gives reasons for this shift today. Faith and Truth, Conversations: The Journal of the Institute for Jewish Ideas and Ideals: This article articulates the point of view that the notion of absolute Truth in Jewish literature is only one of a variety of views found in the Jewish tradition. It argues that a more prominent point of view is the value of Faith and Truth seeking rather than owning an absolute notion of Truth. It brings sources and voices supporting this view. NiSh’ma: Anavah / Humility, Shma Now: Rabbi Levy offers his take on the first line of the “V’ahavta,” the line following the Sh’ma prayer, reflecting on God’s humility — the notion that God needs our love. Noah - What Did Ham Do? VaYishlah - Where is Dinah? BeShalah - Sweet, Sweet Torah! Kedoshim - Be Unique, For I Am! Hukkat - Torah: Does it Make Sense? Balak - Pray for Evil? Hope: A Talmudic Quandary and Remedy, Journal of Pastoral Theology. This article explores the concept of hope through both talmudic and spiritual care lenses. Pastoral Environments and Care for Migrants: Intercultural and Interreligious Perspectives, We Were Once Strangers: Discussions on Radical Hospitality during Challenging Times, Society for Intercultural Pastoral Care and Counseling, 2018. Book Review: Midrash and Medicine: Healing Body and Soul in the Jewish Interpretive Tradition, CCAR Journal, Summer 2012. Book Review: Healing and the Jewish Imagination: Spiritual and Practical Perspectives on Judaism and Health, CCAR Journal, Summer 2009. Complexity and Imperfection: A Theology of Jewish Pastoral Care, Jewish Pastoral Care, 2005. Haftarat Metzorah: The Women’s Haftarah Commentary, 2004. Va'etchanan, A Land Flowing with Milk and Honey: Sexualizing the Land:The Women’s Torah Commentary, 2000. Jewish Journal: “Orthodox. Reform. Let's Talk.,” (Part I) November 7, 2017. A conversation between -- and about -- denominations. Jewish Journal: “Orthodox. Reform. Let's Talk.,” (Part II) December 7, 2017. A conversation between -- and about -- denominations. The Pentateuch (Core Biblical Studies): The Pentateuch, in the Core Biblical Studies series, introduces the Five Books of Moses: Genesis, Exodus, Leviticus, Numbers, and Deuteronomy. It combines a purely literary approach to reading the final form of the Pentateuch with a historical reading of the text. Isaiah 40-66 (FOTL): In keeping with the methodology and goals of the FOTL series, Isaiah 40–66 offers detailed examinations of the formal structure of the chapters covered; the genres that function within these chapters; the literary, historical, and social settings of the text; and the overall interpretation of Isaiah 40–66 and its constituent textual units. The Cambridge Companion to the Old Testament/Hebrew Bible (Co-Editor with Stephen Chapman): This Companion offers a concise and engaging introduction to the Hebrew Bible or Old Testament. Providing an up-to-date 'snapshot' of scholarship, it includes essays, specially commissioned for this volume, by twenty-three leading scholars. The SBL Handbook of Style, Second Edition: For Biblical Studies and Related Disciplines (Hebrew Bible Editor): The long-awaited second edition of the essential style manual for writing and publishing in biblical studies and related fields includes key style changes, updated and expanded abbreviation and spelling-sample lists, a list of archaeological site names, material on qur'anic sources, detailed information on citing electronic sources, and expanded guidelines for the transliteration and transcription of seventeen ancient languages. Reading Prophetic Books: Form, Intertextuality, and Reception in Prophetic And Post-biblical Literature: This volume introduces further studies that take up several key issues, including the reading of prophetic books in their final literary form and the significance of textual versions for this reading. He also observes the intertextual relationships between the prophets and other works of biblical and post-biblical literature, and the reception of the prophetic books. Reading Ezekiel: A Literary and Theological Commentary (Reading the Old Testament): This volume considers one of the most interesting and compelling books of the Hebrew Bible. Ezekiel is simultaneously one of the Bible’s most difficult and perplexing books as it presents the visions and oracles of Ezekiel, a Judean priest and prophet exiled to Babylonia in the sixth century BCE. The Cambridge History of Religions in the Ancient World: Volume 1: From the Bronze Age through the Hellenistic Age (Editor): The Cambridge History of Religion in the Ancient World provides a comprehensive examination of the history of the religions of the ancient Near East and Mediterranean world. The essays in these volumes have a broad reach, covering the ancient Near East and Mediterranean, and extending from the Bronze Age into the late Roman period. Tanak: A Theological and Critical Introduction to the Jewish Bible: Though "biblical theology" has long been considered a strictly Christian enterprise, Marvin A. Sweeney here proposes a Jewish theology of the Hebrew Bible, based on the importance of Tanak as the foundation of Judaism and organized around the major components: Torah, Nevi'im (Prophets), and Kethuvim (Writings). Shofar in the Bible. Qol Tamid: The Shofar in Ritual, History, and Culture. Lawsuit, Laishah, Leb Qammai, Laccunus, Encyclopedia of the Bible and its Vol. 15. Isaiah 60-62 in Intertextual Perspective. Subtle Citations. Hosea’s Reading of Pentateuchal Narratives: A Window for Foundational E Stratum. The Formation of the Pentateuch. Freedom in the Bible: A Jewish Theological Perspective. AJS Perspectives. The BDS Movement: A Threat to Free Inquiry. Encyclopedia of the Bible and its Reception. Jealousy of G-d. Encyclopedia of the Bible and its Reception. Jesse, Stump of. Encyclopedia of the Bible and its Reception. For Whom Does Rachel Weep? TheTorah.com. 2016. Contemporary Jewish Readings of the Prophets. Oxford Handbook of the Prophets. Isaiah 1-39. The Prophets: Fortress Commentary on the Bible Study Edition. Obadiah within the Book of the Twelve Prophets. Obadiah. The Latter Prophets and Prophecy. The Cambridge Companion to the Hebrew Bible/Old Testament. Jewish Biblical Theology: An Ongoing Dialogue. Interpretation. The Jacob Narratives: An E-Stratum Text? The Catholic Biblical Quarterly. The Bible’s Evolving Effort to Humanize Debt Slavery: Parashat Mishpatim. TheTorah.com, February 2, 2016. When the G-d of Justice Goes Rogue: Parashat Yitro. Thetorah.com, January 28, 2016. Eschatology in the Book of Jeremiah. Marbeh Hochma: Memorial Volume for Avigdor Victor Hurowitz. Form and Eschatology in the Book of the Twelve Prophets. The Book of the Twelve And the New Form Criticism. Isaiah 56:1-8 in Form-Critical Perspective. The Genre of Biblical Commentary: Essays in Honor of John E. Hartley on the Occasion of His 75th Birthday. Haggai, Encyclopedia of the Bible and its Reception. Habakkuk, Encyclopedia of the Bible and its Reception. Gog and Magog. Encyclopedia of the Bible and its Reception. Moses, The Oxford Encyclopedia of the Bible and Theology. Biblical Theology. The Oxford Encyclopedia of the Bible and Theology. The Prophets and the Prophetic Books, Prophetic Circles and Traditions—New Trends, Including Religious-Psychological Aspects. Hebrew Bible—Old Testament The History of Its Interpretation. III/2: The Twentieth Century. The Books of Kings. The Oxford Encyclopedia of the Bible and Ethics. The Ezekiel that G-d Creates, The G-d Ezekiel Creates. Foreword: The Oracles Concerning the Nations in Prophetic Literature. Concerning the Nations: Essays on the Oracles against the Nations In Isaiah, Jeremiah and Ezekiel. Isaiah 1-39. Fortress Commentary on the Bible. Modern Study of the Bible. The Jewish Study Bible. Davidic Messiah. The Jewish Study Bible. Introduction to the Prophetic Books. Anselm Companion to the Bible. Introduction to the Prophetic Books. Anselm Companion to the Old Testament. Myth and History in Ezekiel’s Oracles concerning Tyre (Ezekiel 26-28). Myth and Scripture: Contemporary Perspectives on Religion, Language, And Imagination. Form Criticism. Encyclopedia of the Bible and its Reception. The Reconceptualization of the Davidic Covenant in Jeremiah. Reading the Prophetic Books: Form, Intertextuality, and Reception in Prophetic and Post-biblical Literature. Myth and History in Ezekiel’s Oracles concerning Tyre (Ezekiel 26-28). Reading the Prophetic Books: Form, Intertextuality, and Reception in Prophetic and Post-biblical Literature. Differing Perspectives in the MT and LXX Versions of Jeremiah 1-10. Reading the Prophetic Books: Form, Intertextuality, and Reception in Prophetic and Post-biblical Literature. Form and Coherence in Ezekiel’s Temple Vision. Reading the Prophetic Books: Form, Intertextuality, and Reception in Prophetic and Post-biblical Literature. Eschatology in the Book of Isaiah. The Book of Isaiah: Enduring Questions Answered Essays Honoring Joseph Blenkinsopp and His Contribution to the Study Of Isaiah. Farewell Speech. Encyclopedia of the Bible and its Reception. Dimensions of the Shekhinah: The Meaning of the Shiur Qomah in Jewish Mysticism, Liturgy, and Rabbinic Thought. Hebrew Studies. Prophets and Priests in the Deuteronomistic History. Israelite Prophecy and the Deuteronomistic History. The Cambridge History of Religions in the Ancient World. Volume 1: From the Bronze Age through the Hellenistic Age. Israelite and Judean Religions. The Cambridge History of Religions in the Ancient World. Volume 1: From the Bronze Age through the Hellenistic Age. Encyclopedia of the Bible and its Reception Vol. 6. Eschatology in the Book of Ezekiel. Making a Difference: Essays on the Bible and Judaism in Honor of Tamara Cohn Eskenazi. Foundations for a Jewish Theology of the Hebrew Bible. Jewish Bible Theology: Perspective and Case Studies. Ezekiel’s Conceptualization of the Exile in Intertextual Perspective. Hebrew Bible and Ancient Near East. Unfinished Tasks in the Book of Isaiah. Journal of the Korean Old Testament Society. Synchronic and Diachronic Concerns in Reading the Book of the Twelve Prophets. Perspectives on the Formation of the Book of the Twelve. Book of the Twelve. Dictionary of the Old Testament Prophets. Genesis in the Context of Jewish Thought. The Book of Genesis: Composition, Reception, and Interpretation. Articles on Brimstone, Call Stories. Encyclopedia of the Bible and its Reception Vol. 4. To Health! : The New Humanistic Oncology: A unique exploration of the workings of peoples’ inner world after they have received a cancer diagnosis: their profound turmoil and struggle, their feelings, thoughts, images, intuitions, and dreams, their conflicts and inspirations. From Fear to Awe: This book shows how Job, and through him every man, found illumination and peace in the face of divine inscrutability. In what amounted to a lengthy journey towards health and wholeness, Job traverses nine distinct-stages that ultimately help him attain the spiritual well being he craved for. Paradise Lost, Paradise Regained: The book is a must read for anyone interested in understanding our Hebrew ancestors efforts to overcome suffering and how to take advantages of their experience in our own efforts to transcend it and live an enduringly happy life. Faculty: Click here to submit your original works for inclusion on this page. Laughs and Tears, Atlanta Jewish Times: This article recounts the authors memories of Jewish humor growing up in Odessa. Sha'alu Shalom - A composition included in a recent Shabbat Anthology produced by the American Conference of Cantors Transcontinental. This is the Day, Poems inspired by the practice of counting the Omer: A collection of poems that embody the intersection of spiritual practice and creative process. They come from simple day-by-day awareness, cultivated over a 49-day period through the ages-old practice of counting the Omer. Moral Change: A Tragedy or A Return: In this book, Macht integrates his academic, theological, pastoral, and professional careers as an actor, producer and director, and shares his passion for Jewish values via the arts to the world community. "Dor l'Dor" (Generation to Generation) - A collection of songs for children entitled "Dor l'Dor" (Generation to Generation) for his granddaughter Sarah. One of the songs, "Eli, Eli," was made into a video and now has over 100,000 views on You Tube. Alumni and Students: Click here to submit your original works for inclusion on this page.